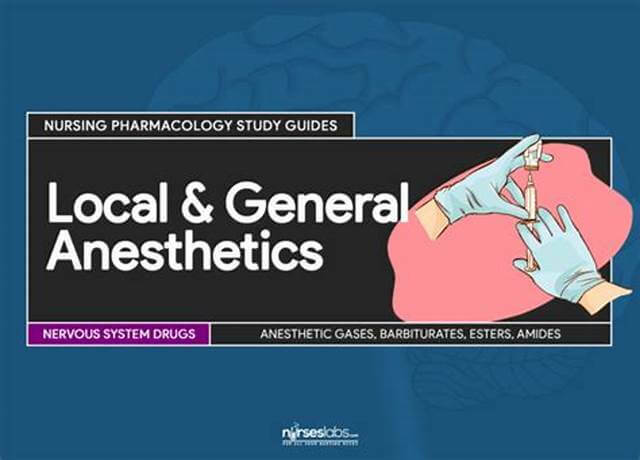 The second type is local anesthesia which numbs only specific targeted area of the body drugs that are used to induce local anesthesia are called local anesthetics now anesthesia performed with general anesthetics occurs in four stages that were first introduced and described back in 1930s these four stages remain essentially the same over time however updated delivery methods and modern and aesthetics have improved the speed of onset safety and recovery so the first stage is known as induction it is simply a period during which the patient goes from state of consciousness to a state of unconsciousness next we have the second stage known as excitement at this stage depression of inhibitory neurons in the CNS leads to increased excitement involuntary muscle movement increased heart rate blood pressure and respiration. Next we progress to the third stage known as circuit surgical anesthesia at this stage there is a gradual loss of muscle tone and reflexes patient is fully unconscious and responsive to surgery and as regular breathing this is the ideal stage for surgery and careful monitoring is necessary to prevent further progression to stage four known as medullary paralysis or overdose at this stage respiratory and cardiovascular failure occurs which lead to death if the patient cannot be revived quickly now let’s move on to discussing how general anesthetics work so the mechanism of action of general anesthetics is not entirely clear although early tear focus on a single common pet of action for all anesthetics over time it has become increasingly apparent that multiple sites and different mechanisms are most likely responsible for the effects of general anesthetics so at the macroscopic level the action of general anesthetics on thalamus and reticular activating system leads to reversible loss of consciousness the action on the hippocampus amygdala and prefrontal cortex causes amnesia and finally the action on the spinal cord is responsible for immobility and analgesia now at the molecular level things get a little bit more complicated so to make it simple. We can divide general anesthetics into three groups based on their relative abilities to produce unconsciousness immobility and analgesia but before we proceed in order to gain a better understanding of mechanism of action of anesthetics I think it’s important to know how nerve impulses are generated therefore for those who need a refresher out highly recommend to first watch my video about neuronal action potential now going back to our grouping of general anesthetics the first group consists of intravenous agents etomidate propofol and barbiturates these drugs are much more potent at producing unconsciousness rather than in mobility or analgesia and they are commonly used in the induction phase their effects appear to be mediated by a subset of gamma amino butyric acid type II receptors GABA aid for short so gaba-a receptors are located both postsynaptically and extra synaptically on the majority of neurons in the central nervous system near a compulsive pentameric arrangements of subunits and a central ion channel port when endogenous GABA binds to this receptor it causes a conformational change which opens central pore allowing chloride ions to pass down electrochemical gradient this in turn leads to stability or hyper polarization of the resting potential making it more difficult for exciter in neurotransmitters to depolarize the neuron and generate an action potential. So when etomidate propofol and barbiturates bind to specific sites on the GABA a receptor they prolong opening of the channel surprise neuronal excitability and does promote unconsciousness now when it comes to side-effects etomidate can cause adrenal suppression and transient skeletal muscle movements including myoclonus propofol is known to cause respiratory depression and hypotension lousy barbiturates can cause apnea cough bronchospasms and just like propofol respiratory depression now let’s move on to the second group of general anesthetics which consists of intravenous agent ketamine and inhalation agents nitrous oxide xenon and cyclopropane in contrast to group 1 and group 3 agents these drugs produce significant analgesia however their ability to produce unconsciousness and immobility is relatively weak because of that these drugs are typically used in the maintenance phase of anesthesia unlike the drugs in Group 1 the group 2 drugs have little to no effect on gaba-a receptors and instead their effects appear to be mediated primarily by an metal D aspartate receptors NMDA for short NMDA receptors are located in a spinal cord and are crucial in pain modulation and processing when neurotransmitter glutamate binds to NMDA receptor it causes inflow of extracellular calcium into the postsynaptic neuron which then activates a series of signaling molecules causing the pain signal to increase and fire more frequently now ketamine nitrous oxide xenon and cyclopropane selectively inhibit NMDA receptors which ultimately prevents or decreases neurotransmission of pain group 2 general anesthetics also affect members of the to poor domain potassium channel family which regulate the resting membrane potential of neurons specifically they promote the opening of these channels leading to increased potassium efflux producing a reduction in neuronal excitability that contributes to their sedative effects now when it comes to adverse effects ketamine can cause hypertension tachycardia and hypersalivation as well as emergence phenomena ranging from vivid dreams to how’s the nation’s and delirium that may continue for 24 hours after treatment next nitrous oxide and cyclopropane are known to cause dizziness nausea and vomiting lastly we have xenon which has many characteristics of the ideal anesthetic and has virtually no significant side-effects now let’s move on to the third group of general anesthetics which consists of halogenated volatile anesthetics halothane and fluorine isoflurane sevoflurane and desflurane in contrast to Group one and two drugs Group three drugs have more diverse mechanism of action and are more potent at producing immobility studies suggest that voto anesthetics produced unconsciousness be different GABA a receptor subunits than those targeted by the Group one drugs also many to poor domain potassium channels that are activated by group 3 anesthetics appear to highly affect immobility rather than anesthesia just like group 2 drugs. volta anesthetics also inhibit NMDA receptors a wide variety of other item channels are also sensitive to water anesthetics including neuronal nicotinic acetylcholine receptors serotonin type 3 receptors sodium channels mitochondrial ATP sensitive potassium channels and hyper-polarization activated cyclic nucleotide gated channels now when it comes to side effects all the agents in this group produced a dose-dependent reduction in blood pressure and cardiac output additionally Halloween in particular may cause cardiac arrhythmias and hepatotoxicity while sevoflurane may cause renal toxicity now before we move on there is one more agent that’s worth mentioning here which doesn’t belong to any of the three groups that we discussed so far and that is Dex matter Tommy Dean unlike the other commonly used general anesthetics Dex matter Tommy Dean has a unique ability to produce sedation and analgesia without the risk of respiratory depression these effects result from its binding to the presynaptic alpha-2 adrenergic receptors of the subtype 2a which are located in a brain and spinal cord the action on these receptors inhibits the release of norepinephrine terminating the propagation of pain signals and inducing light sedation when it comes to side-effects of decks matter Tommy Dean the most common ones are bradycardia and hypotension as was transient hypertension due to weak peripheral alpha-1 receptor agonist activity now let’s switch gears and let’s move on to brief discussion of the pharmacology of local anesthetics unlike general anesthetics local anesthetics produced transient loss of sensory perception especially of pain in a localized area of the body without producing unconsciousness so how do these drugs work due to their distinct chemical properties? Local anesthetics are able to pass through the neuronal membrane and bind to a specific receptor at the opening of the voltage-gated sodium channel thus preventing sodium influx this in turn prevents the initiation and conduction of action potentials which ultimately leads to loss of sensation in the area’s supplied by the nerve examples of the most widely used local anesthetics are poppy the cane lidocaine the pivot cane procane rope ever cane and tetra cane when used properly look on aesthetics are generally very saved and serious reactions are rare however when systemic toxicity occurs patients may experience symptoms ranging from blurry vision and lightheadedness to seizures and cardiac arrhythmias and with that I wanted to thank you for watching I hope you enjoyed this article and as always stay tuned for more.